Expert Quality 7 piece screwdriver and bit set. Fitted with an easy to operate forward and reverse mechanism. Supplied with extra long 89mm bits, manufactured from hardened and tempered chrome vanadium steel. 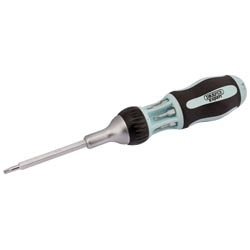 The tips on each screwdriver bit have been sand blasted, providing greater grip when engaged with the screw head. Even when used for prolonged periods, the ergonomic soft grip handle delivers unparalleled user comfort, whilst also being a convenient storage place for the extra-long bits. The universal bits can also be used in power drivers and other tools providing even greater flexibility of use. A great universal screwdriver and bit set for the home and workplace toolbox.